Personalizing a home is always at heart for most homeowners. It always is done in an effort to make the place look and feel unique. Structural renovations to the house are as significant and valuable as is doing the same to the outdoor space. And since the entrance from the gate to the house is where everyone will pace, installing or upgrading the driveway by paving it is one of the essential things to do for your home. When paving your driveway, it is advisable that you consider the pavers you use to ensure that you get an option that will not only serve its purpose but is also aesthetically pleasing, long-lasting and cost-effective. With so many paving materials available, finding an option that suits your needs can be a bit tricky. However, there is one option that you can never go wrong with, and that is concrete pavers. When weighing the pros and cons of different paving materials, concrete pavers often stand above the rest. Here is a look at why these pavers are so widely used today and why you need to consider integrating them into your landscape. Moreover, most pavers are manufactured at intense pressures. The result is remarkably solid units that possess exceptional durability and strength, superior stability even under heavy loads. They have exceptional weather resistance; an outstanding tolerance to extreme cold and heat, and are not affected by deicing salts. As concrete pavers are available in a wide variety of options, you can create any pattern you like in your driveway or walkway. Some pavers have tongue and groove designs that allow them to interlock, while others have smooth edges. They can also be molded and textured to resemble bricks, stones or other surfaces. At the same time, you can have your pavers custom cut or manufactured to suit a design of your choice. In short, they offer flexibility in the custom design with the added perks of value and visual appeal. The pavers are an ideal option for land with a varied gradient; they can be installed on the contours of a property with dips or slopes since they can be laid over and fit, blending well over the topography. The cost of these pavers is much less than that of other types of paving products as they are manufactured using machines compared to naturally-occurring products; as a result, they are much cheaper than sandstone pavers, granite pavers, and clay pavers. 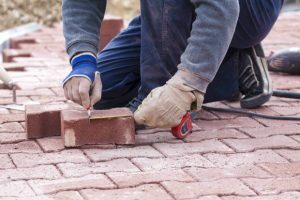 When it comes to replacement and maintenance costs, concrete pavers are more economical when looking at the long-term as they last a long time and are easy to install. And speaking of installation, the job can be done by a professional contractor within a matter of days. The pavers have low life-cycle costs thus they are low-maintenance compared to other paving options include stamped and poured concrete. Cleaning is mostly straightforward with it required the occasional sweeping and rinsing. Pressure washing with the correct cleaning solutions and a bit of scrapping with a brush may be necessary when dealing with stubborn stains. Hiring the professional cleaners is ideal when dealing with pavers that have unique finishing such as staining. For repairs, this can be done with little complications with options that include resurfacing, patching, or replacement. The driveway is one of the most important elements of a property as it is amongst the first things that people, including potential investors, will see when approaching your house or home. As such, the installation should be perfect, and this calls for having the job done by the done by reputable and experienced professionals. Give preference to contractors who present to your different installation designs after assessing your home’s topography to determine the best option.